Ruger’s 2018 net sales decreased 5 percent from 2017, which the company says reflected the reduction in overall industry demand. We’ve all heard about the so-called “Trump slump” as it relates to gun sales, so how did Ruger do during 2018? The following info was recently released by the company. Sturm, Ruger & Company, Inc. announced that for 2018 the Company reported net sales of $495.6 million, compared with net sales of $522.3 million in 2017. For the fourth quarter of 2018, net sales were $121.1 million. For the corresponding period in 2017, net sales were $118.2 million. 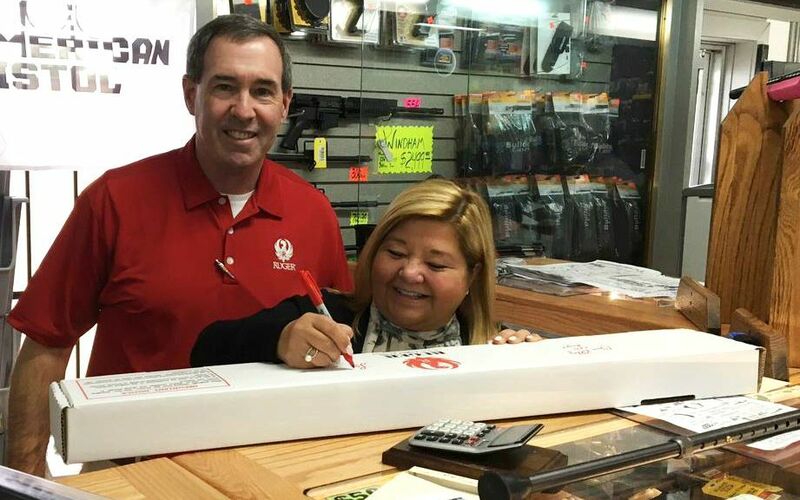 Ruger CEO Chris Killoy and his wife, Liz. In 2018, net sales decreased 5 percent from 2017, reflecting an apparent reduction in overall industry demand as evidenced by the National Instant Criminal Background Check System (NICS) background checks (as adjusted by the National Shooting Sports Foundation), which decreased 6 percent in the same period. The estimated sell-through of the Company's products from the independent distributors to retailers remained consistent with the prior year due in part to continuing demand for some of the Company's products, particularly those that were introduced in December 2017. New products represented $145.6 million or 30 percent of firearms sales in 2018, compared to $137.8 million or 27 percent of firearms sales in 2017. New product sales include only major new products that were introduced in the past 2 years. In 2018, new products included the Pistol Caliber Carbine, the Precision Rimfire Rifle, the Mark IV pistol, the LCP II pistol, the Security-9 pistol, and the EC9s pistol. In 2018, the Company's finished goods inventory decreased 23,000 units and distributor inventories of the Company's products decreased 22,000. In the aggregate, total Company and distributor inventories decreased by 10 percent in 2018. Cash generated from operations during 2018 was $119.8 million. On Dec. 31, 2018, Ruger cash and short-term investments totaled $152.8 million. Ruger has no debt. In 2018, capital expenditures totaled $10.5 million. Ruger expects its 2019 capital expenditures to total approximately $25 million. In 2018, Ruger returned $19.2 million to its shareholders through the payment of dividends. Click here for more information on Ruger firearms.